Jo Crosier: Horror Movies Continue! 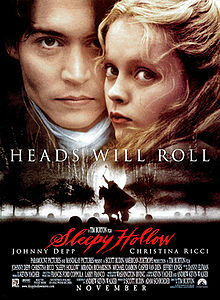 Last week, we watched Sleepy Hollow, which is so very much both a romance and a horror movie all mixed into one. Now, those elements are not easy to balance. I know this because I've attempted to write other flavors of romance like romantic suspense and trying to balance the creepy suspense elements, the driving, break-neck speed pacing of the suspense plot, with the slow build and sexiness of a romance is hard work. So, again, I say, Well done, Burton. Well done!